B' e seinneadair Aimeireaganach a bha ann an Elvis Aaron Presley. Rugadh e air 8 am Faoilleach 1935 ann an Tupelo, Mississippi agus chaochail e air 16 an Lùnasdal 1977 ann am Memphis, Tennessee. 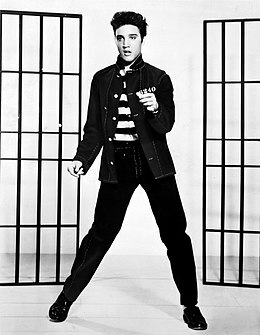 'S e "King of Rock ’n’ Roll" am far-ainm a th' air. Chaochail a mhanaidsear, fear à Breda sna Tìrean Ìsle air an robh Còirnealair Parker, ann an 1997. Air a tharraing à "https://gd.wikipedia.org/w/index.php?title=Elvis_Presley&oldid=544910"
Chaidh an duilleag seo a dheasachadh 2 dhen Fhaoilleach 2019 aig 14:06 turas mu dheireadh.